Tribal Link Foundation was founded on the principle that the world's indigenous peoples must survive, and that indigenous peoples should speak for themselves, not be spoken for, and in so doing, produce outcomes that are most relevant to their communities. Protecting indigenous lands and peoples are key to all of our survival. Today, #GivingTuesday, please consider supporting our work with Brazil’s indigenous leaders and their communities—the stewards of our world's largest and vital rainforest. With the rising threat of climate change and the Amazon rainforest in danger of further decimation due to a new Brazilian government hostile to indigenous communities, it’s more important than ever to stop agribusiness, mining, and logging in the world’s largest rainforests. Of course, any large-scale deforestation of the Amazon, or genocide of its protectors—indigenous peoples—would have catastrophic consequences for the global climate. Your generous contribution to Tribal Link will go toward supporting projects that strengthen indigenous peoples' leadership and bring them essential skills and tools, so they can more effectively protect their rights, territories, and resources. Concretely in the Amazon, we are partnering with Céline Cousteau's Tribes on the Edge campaign to organize a strategic meeting with the Union of the Indigenous Peoples of the Vale do Javari so they can determine their own plan for socio-economic development. We're also looking to have a specific focus for our annual capacity-building training for Indigenous Peoples, Project Access, on Brazil, in order to strengthen indigenous leaders coming to advocate at the UN Permanent Forum on Indigenous Issues. Irvince Auguiste is a Tribal Link Project Access Alumni and a former chief of the indigenous Kalinago people of Waitukubuli, known as Dominica in the Caribbean. On September 17th 2017 his island was devastated by ravaging hurricane María. 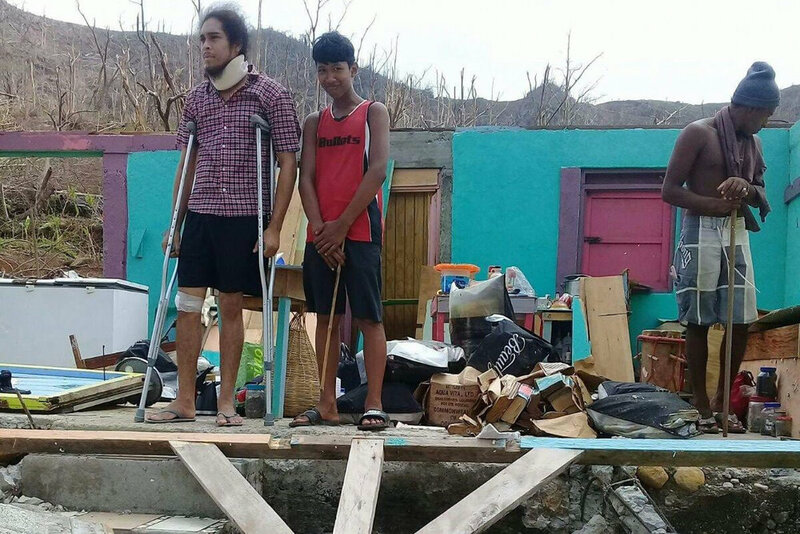 His family of nine members, as well as the complete village, was one of the most impacted on the island. After María only five houses standing remained of a community of in total 38 households. Irvince's house and car were totally destroyed. Three of his sons were injured. One of them called Tikenti was covered under a concrete wall of their house. Due to his severe injuries, he had to be flown to another island for medical attention. After losing everything they had built and owned over 30 years, the past year the family has been dealing with all that came with the hurricane’s aftermath. His son’s treatment has been very costly until now, many of the materials have to be shipped from abroad and the economy oriented on tourism, the family’s source of income, has not recovered yet. Irvince’s family survived, but they are still living in tents without proper roof or facilities for a dignified new beginning. Nearly a year after losing everything, tired of waiting for governmental help and in the fear of the upcoming hurricane period, Irvince now asks you for help. His home was always open for all visitors and will always be. Last Sunday the new hurricane period officially started and his family is not asking for any luxury but a safe home. The requested amount will be spent on buying materials and tools for a new house. If required the details of expenses spent will be provided through email. Please contribute to this account and be sure that if you come one day to his house, you will be received with all hospitality and gratitude. When the family has a new home they can continue helping others in the community. #TimeisNow! Join the Global Campaign to Make Indigenous Women Visible! There are approximately 185 million indigenous women in the world, belonging to more than 5000 different indigenous groups. Despite the broad international consensus about the important role indigenous women play in eradicating hunger and malnutrition, there are still limitations in the recognition and exercise of their rights. The empowerment of indigenous women is not only a central issue but also a necessary condition to eradicate hunger and malnutrition in the world! To reach this goal and to leave no one behind, we need you! Support the#IndigenousWomen Campaign: Make them visible, empower them! Smile, soon you will receive a social media kit to make#IndigenousWomen visible! PS: And please share this video on your social-media today!